In the area of Drinks Logistics, JCL offers individual services and a comprehensive logistics system for fragile und sensitive goods, for instance wines, spirits, beers and other drinks. 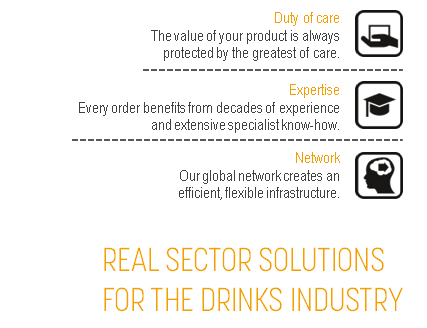 Our industry expertise offers specific services that take your delivery safely and reliably to your desired destination and support your entire supply chain in the area of the international drinks industry. In addition to the picking of your goods, we also deal with the special packaging and protection and offer, among others, secure shelf and block storage, box and bottle picking and end-to-end Track & Trace.